In this comprehensive guide, we offer you the most current info on SAT test dates (domestic and international) for the 2016-17 and 2017-18 school years. We also give you our top tips for choosing the best SAT test dates for you, as well as tons of resources you can use to assist you in navigating the complicated web of SAT/ACT test dates. In general, the College Board administers the SAT on Saturdays, with more tests offered in the fall. If you can’t take the test on a Saturday for religious or other reasons, Sunday alternate datesare usually available. Below, we give you all SAT test dates, normal registration deadlines, late registration deadlines, and score release dates for the 2016-17 and 2017-18 testing years. Although the 2016-17 dates and deadlines have been officially confirmed by the College Board, some of the 2017-18 dates are still tentative; thus, some of the 2017-18 registration deadlines and score release dates are projections based on patterns of previous testing years. I’ve listed international test dates in separate tables since the SAT is administered on fewer dates outside the U.S. Note that in the U.S. (and abroad, as of 2018), SAT Subject Tests are available on all SAT dates except March. In 2018, there will no longer be a January test date. This date is instead being replaced by an earlier August test date (starting in 2017) which will only be available in the U.S. Additionally, from the 2017-18 testing year onward, the international November and June test dates will offer only SAT Subject Tests. When it comes to choosing SAT dates, you don’t want to simply register for the next available date. To help you select the best SAT test dates for you personally, we’ve created an easy-to-use visual calendar using the 2016-17 SAT test dates. 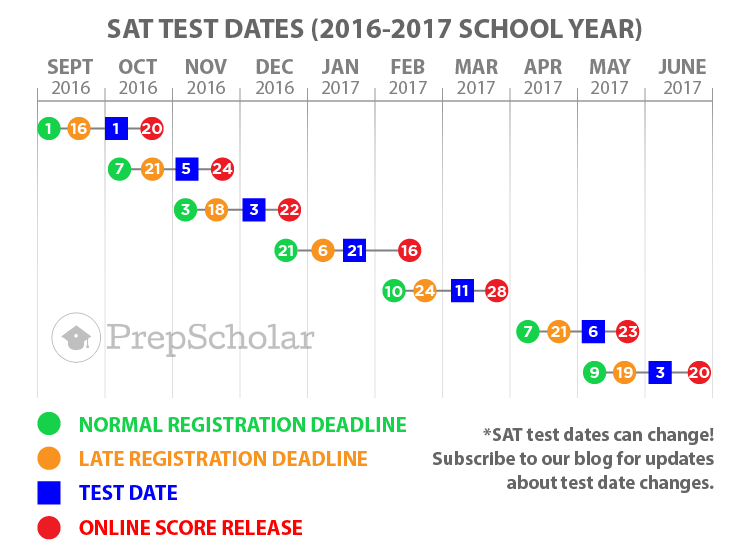 This infographic allows us to look at trends in SAT dates and see whether certain dates and deadlines overlap with others. As you can see on this visual calendar, SAT test dates are tightly clustered in the fall. This is due to the fact that most college application deadlines are in the late fall and early winter. Essentially, the College Board is giving seniors multiple shots at hitting their SAT goal scores right before their applications are due. In the spring, SAT dates are more spread out, with the exception of May and June. This is, again, due to the fact that there are fewer college application deadlines in spring than there are in fall and winter. These dates are also geared more toward juniors and other students who’d like to take the SAT early. Next, we can see that because of the high number of test dates in the fall, it’s difficult to take two SATs in a row. By the time your score for one test comes out, the late registration date for the next test will have often already passed! So even if you were to go ahead and register for another test without knowing your scores, you may end up ultimately wasting money on a retakeif your scores are higher than you thought they’d be. Likewise, if you don’t sign up for the following test, you may miss your only shot at raising your scores before your application deadlines. Taking back-to-back SATs also doesn’t give you enough time to make the most out of your retake; you’ll likely see little, if any, improvement in your scores due to the lack of adequate prep time in-between tests. Need extra assistance with choosing SAT test dates? Our top resources below will help you pinpoint the best SAT dates for you. 2016 & 2017 Full Review of Every SAT Test Date: Don’t miss this guide! Here, our experts review every possible SAT test date and discuss the pros and cons of choosing each date based on your high school grade level (10th, 11th, and 12th). When Should You Take the SAT or ACT? Best Test Dates: Our popular guide to SAT/ACT test dates zeroes in on the four most important factors you’ll need to consider when selecting a test date. You can also check out our more general guide to the other major factors that come into play when choosing a test date. SAT/ACT Test Dates & Study Plan for Sophomores and Juniors: Seeking advice on when to take the SAT or ACT your sophomore or junior year? This guide walks you through a typical SAT/ACT test-taking schedule and offers targeted tips for honing your weaknesses. 5 Step SAT/ACT Test Dates & Study Plan for Summer Before Senior Year: This step-by-step guide explains how to structure a personalized SAT/ACT study plan before your senior year. The Best SAT and ACT Test Dates for Senior Fall: Looking for a guide geared specifically toward seniors? Here, we lay out the SAT/ACT test dates in autumn and provide you with tips on how to choose the best date for you. Can I Get an Alternate SAT Test Date? 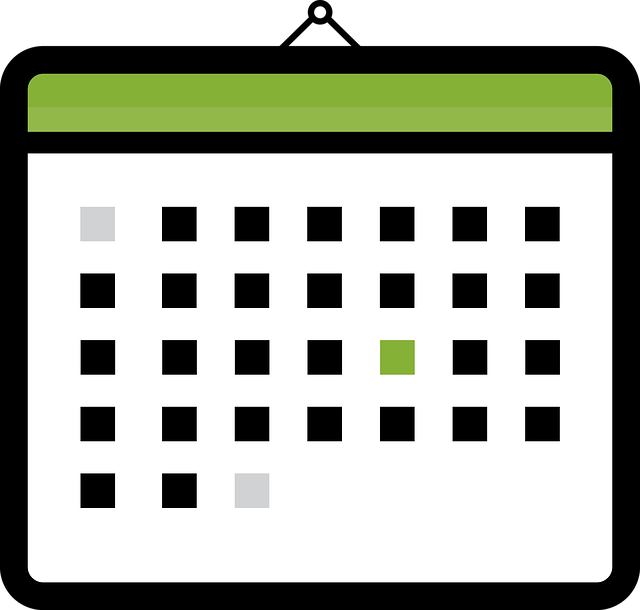 : If there’s a conflict with your current SAT test date, you may be able to schedule an alternate test date for the following week. Read our guide to learn everything you can do to ensure your request is successful. SAT Subject Test Dates 2017: When Should You Take Them? There is no August test date outside the U.S.
As of the 2017-18 testing year, the international November and June test dates will only offer SAT Subject Tests — no regular SAT. To choose a test date that’s right for you, you must consider when your college application and SAT scholarship deadlines are, how many times you want to take the SAT, how much time you’re willing to study, and whether you’ll have any outside obligations that may prohibit you from taking the SAT on a certain date. Hopefully, after reading this guide, you now have a clearer and more confident sense as to which SAT test dates will work for you! you need to register with collegeboard.com before registration deadlines!